There will be hot conditions with temperatures getting into the mid to late 30s and early 40s ahead of the change/trough. The coastal fringe will be cooler with the sea breeze though. Thunderstorms are likely to occur on all three days within the region too. An area of storms is also currently moving into the northern MNC and southern NTs late this evening. Northern NSW action will start a lot earlier than the possibilities for Friday and Saturday for SEQ and Wide Bay and West. BoM have come on board forecasting storms for Saturday now and stated that they could be possibly severe on Saturday. Personally I always considered Saturday to be the better of the 2 days even before it was mentioned. I do like the setups although if the cold upper air could have pushed further North , hail could of been a serious threat, in saying that hail is still not out of the equation because minus - 32°C is still pretty cold, but usually when it is around - 38°C to 42°C that is when you really worry. I think Coffs Harbour is sitting under that area of cold uppers now. I will be keeping a close eye on the latest updates for sure. If I recall correctly, thunderstorms have been mentioned for Saturday (as well as Friday) in the official forecast on most days, for some days now. Re those upper temps - I'm assuming you're referring to the 300hpa temps? If so, the midlevel temps (e.g. 500hpa) are a far better indicator of whether it's cold enough upstairs to support large hail (anything below about -4C there can support hail).... obviously other factors are really important as well (shear, moisture content of the rising air parcels, instability, etc). Just hope that the usual bugbear of cloud cover or activity from Friday doesn't spoil put a lid on things.One way or another as mentioned previously make the most of it people Go for a long drive even.The Squidge looks to take hold after Sunday. Hi Ken, I noticed that it only appeared on Wed morning unless it was in the district forecast or somewhere else.. I only just glance at the day to day then go to the usual suspects ( models) and run through those. Yes I was looking at the 300 I have always noticed when they are up in the high -30’s and Into to the -40’s combined with the negatives at 500, it usually goes off badly. Sysdney was and still is sitting under minus 40°C and got hammered. Had a friend post they went through 5 storms on MondayI think it was, and verything was just smashed. Trees down, power out, Police directing traffic. It is just something I have observed, whether it has any merit is another question, just an observation over the years. Sorry posting on the run, have to drop wife off. The BOM surface synoptic showing ridge has left the coast . The weatherzone synoptic is showing some ridging still persisting in our neck of the woods. I am not sure of the difference. Use of different models? The update time may vary? Just gotta love the weatherzone synoptic map on their front page. I accidentally made it scroll across and it zooms as well to see the synoptic in . The 10pm BOM synoptic tonight showing the trough line still quite away from us out west but BOM has pencilled in pre-trough line rain signal. The synoptic showing a dumbbell embedded low on the trough and our area ( west of the divide). is near the southern quadrant of the embedded low, where an embedded rotating local feature is likely perhaps in the evening? I just went back through the records and "Chance of a thunderstorm" has been mentioned in the Brisbane forecast (area) for Saturday every day since it came into the 7-day time window. It wasn't until Tuesday that the icon was changed to a thunderstorm icon though (which is standard practice when confidence grows enough to warrant it for a point location). The 300hpa temps are often correlated with systems that extend into the upper levels which in turn can encourage thunderstorms but the primary hail growth zone in thunderstorms typically occurs somewhat lower down (mainly through the midlevels) depending on the storm. Like you I love the Access maps that get put out Crikey giving us a closeup eye on things locally, pretty reliable as well.Looking at them over a 7 day time period in conjunction with the European models gives us a fair idea on how things will pan out but from now on during the storm season because things can change so radically I'm only Goin to seriously look at it the day prior. Places under the main area of storms last night / early this morning doing very well with 71mm at Wollomombi and 53mm at Glenreagh. Plenty of lightning too. 8.0mm in the 24hrs to 9am here from last night's storm activity. OK.. we have another input into our event thread. This flow contracts out to sea late Friday and then the trough arrives with hopefully the increased moisture from the EASTERN infeed from owen. There is another feature for Friday night worth keeping an eye on. A kink or intersection of two co-joining lines( kink location_brisabane /tweed) coastal. and having said that.. no sign of cloud spill from owen on sat pic currently but windstreams says its happening . 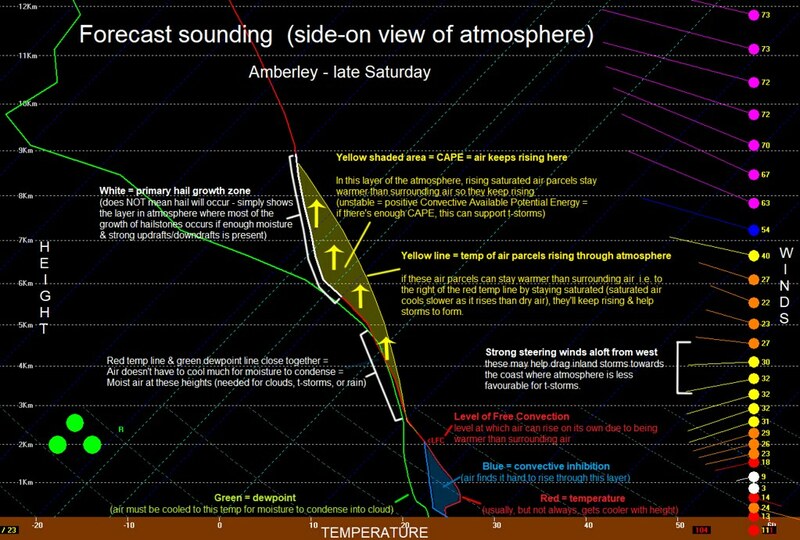 I know a number of people often ask about how to interpret soundings so I've used sounding software to display one for late Saturday over Amberley as an example and then put explanations on it. (often not the case depending on the situation e.g. when strong capping is present, any parcels that do manage to rise will be mainly rising from above the cap (unless the cap breaks) and not originate with the same temp and dewpoint as the surface air upon which surface-based CAPE is calculated.... a shallow moist layer near the ground can also cause high surface-based CAPE values even if the air above is way too dry to support thunderstorm formation). In other words, surface-based CAPE values can give misleadingly high CAPE values if it's used for the wrong situation and other versions of CAPE such as mixed layer CAPE and effective inflow layer CAPE should be used when it's warranted. Of course, this is just an idealised example based on a model which itself is subject to error and in reality, there'll be at least some mixing going on which means CAPE won't start precisely from the level indicated. But you'll note in the above example that most of the CAPE isn't your standard surface-based CAPE (due to the more stable layer near the surface from the cooler change) but CAPE from parcels rising from aloft. Strong westerly steering winds may also help advect inland storms towards the east.... BUT any pre-existing activity in the morning (if any at all) makes the forecasting of Saturday afternoon/evening's thunderstorm potential harder than it otherwise would be. Thanks Ken,nice explanation of a subject that can be hard to get ones head around. Absolutely fabulous Ken.!! Thanks so much for the time you put into that.. I have taken a copy to remind myself when necessary. NSW coast high dp's to..
Terry Hills and Penrith ..dew point 25.6 deg c?? Yes thanks Ken for that map, I might even use that map as my desktop background. Certainly some high DP's about, I had a high 24.5c earlier, currently 22c. Likewise Ken, invaluable that , what would we do without ya ! Maybe read the BOM"s forecasts. Lovely tropical today, 38.2C max, still 36.5C atm 35%RH. Been watching that tall healthy looking thundercloud to the south rise & being hopefull. Maybe a harbinger for tomorrow & Saturday. Yea, a lot of red & black on that Sydney radar. Some up here please. Just noticed BOM added gusty & severe to their forecast. Wasnt in earlier forecasts, let it happen.